We are an experimental ultracold atomic physics group in the Physics department at UC Santa Barbara. Our group uses quantum degenerate gases of lithium and strontium to explore a wide variety of quantum mechanical phenomena. Research interests include nonequilibrium quantum dynamics, quantum emulation of ultrafast phenomena, quantum quasicrystals, Floquet engineering, anyon synthesis, and quantum metrology. Congratulations to Dr. Kevin Singh on a successful dissertation defense! Our paper reporting Floquet band engineering of long-range transport and direct imaging of Floquet-Bloch bands has been published in Phys. Rev. Letters. Our paper reporting experimental control and characterization of Floquet prethermalization is available on the arXiv. 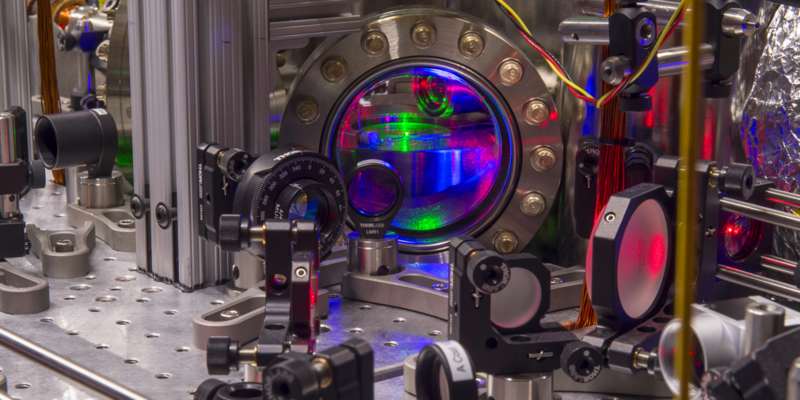 BIFROST, a new ARO-supported multi-user distributed tunable laser facility, is up and running (article). This unique instrument was conceived and commissioned by the Weld group in collaboration with 8 other UCSB experimental groups. Congratulations to Dr. Ruwan Senaratne on a successful dissertation defense! Our paper reporting the experimental realization of a relativistic harmonic oscillator has been published in New Journal of Physics. Now featuring a video abstract by Cora! The lithium team's paper describing the experimental observation and uses of position-space Bloch oscillations (a collaboration with theorists at Lisbon and Paderborn) has been published as an Editor's Selection in Phys. Rev. Letters and spotlighted with a commentary on the APS Physics website. Ruwan and Shankari's paper on experimental quantum simulation of ultrafast dynamics with ultracold strontium has been published in Nature Communications. Our collaborative project with Sumita Pennathur's group recently demonstrated a new class of energy harvester. The paper has been published in Phys. Rev. Applied. Congratulations to Dr. Zachary Geiger on a successful dissertation defense! A paper reporting observation of new superradiant regimes in a Bose-Einstein condensate (a collaboration with the Ketterle group at MIT) is published in PRA. The Weld group is part of the new UCSB-led ARO MURI which focuses on realization of anyons in cold atoms and graphene. Our feature article on Quantum Emulation of Extreme Non-equilibrium Phenomena with Trapped Atoms" has been published in Annalen der Physik. Zach put together this animation of the life cycle of a BEC, which follows our lithium atoms from MOT loading through gray molasses, magnetic trapping, RF evaporation, optical trapping, and Feshbach-enabled optical evaporation to the emergence of a condensate. David recently discussed nonequilibrium matter and the goals of our NSF project on the public radio program The Academic Minute (link). The group's first all-undergrad paper, "Photoacoustic ultrasound sources from diffusion-limited aggregates," has been published in Applied Physics Letters. David has received an NSF CAREER award for research on quantum emulation of strongly driven interacting systems (article). Kevin's paper, "Fibonacci Optical Lattices for Tunable Quantum Quasicrystals," an IQE collaboration with the Parameswaran group at UC Irvine, is published in PRA. Our paper on adiabatic cooling via the bosonic spin Mott phase (a collaboration with the MIT and Strathclyde groups) is published as a rapid communication in PRA. This article and video, starring several Weld group members, describes the outreach program Physics Circus. Ruwan's paper on a microcapillary-based oven nozzle is published in RSI. The Weld group is part of the California Institute for Quantum Emulation (CAIQuE), funded by a President's Research Catalyst Award. This five-campus collaboration includes experiment and theory groups at UCLA, Berkeley, Irvine, UCSB, and UCSD. Slava's paper on a permanent-magnet-based "self-assembled Zeeman slower" is the cover article in Journal of Physics B: Atomic, Molecular and Optical Physics. Motivated graduate students and postdoctoral researchers interested in working with our group should email David Weld.